Beginning Monday, July 23, at 7 p.m., weather permitting, contractors for the North Dakota Department of Transportation (NDDOT) Fargo District and City of Fargo Interstate 94 (I-94) and South University Drive interchange reconstruction project will reduce traffic to one lane in each direction. 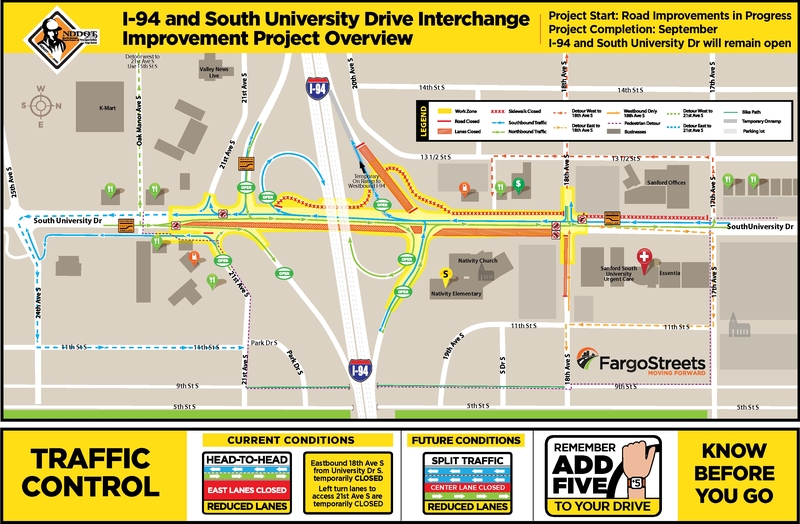 Motorists will be shifted head-to-head on the westside of the roadway to allow enough room for paving operations to occur from 18th Avenue South to the I-94 onramp. By Tuesday morning, once crews have finished paving traffic will return to two southbound lanes and one northbound lane. Left turn lanes on South University Drive to access 21st Avenue South are temporarily closed and detoured. 18 TH AVENUE S AND SOUTH UNIVERSITY DRIVE TRAFFIC SIGNAL – The detoured single lane of eastbound traffic is slated to reopen by early next week, Tuesday July 24, weather permitting. The reconstruction project work on the east side of South University will continue for the next one – two weeks to complete removals, underground and paving operations.